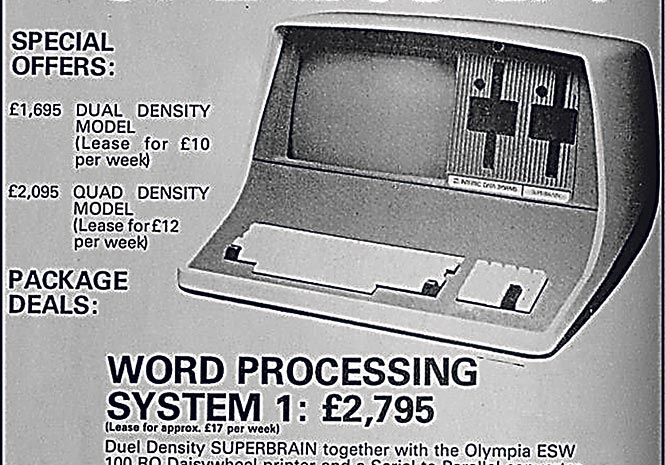 WORD PROCESSING anno 1982: €7,500 in today’s money. NOVELIST Lee Child recently confessed his difficulty when writing a new book: he can’t figure out Word’s automatic page numbering. Can you? Decades after the nostalgic clacking of typewriters gave way to the magic of the word-processor, at best, we sit in the driver’s seat and can just about steer the thing. It’s surprising how few of us can manage to even switch on the wipers, as it were. With most people using less than 10 per cent of what these programs can do, say the experts, Lee Child’s dilemma sounds familiar. (He gets around it, incidentally, by simply writing his next book over the previous one). Microsoft certainly didn’t help back in the day when it managed to infuriate pretty much everyone with Clippy the dancing paperclip to ‘help’ us find our way around Word. If that’s not when the Oxford Dictionary admitted ‘computer rage’ as a real term, it should have been. I graduated years ago from PC-Write with the screeds of keystroke cheat-sheets needed to work it, to the much-lamented WordStar and then the doyen of them all, WordPerfect. Which wasn’t, but it tried. ‘Also-rans’ apart, today we’re down to just two main alternative word-processors of note against Microsoft’s steamroller. WordPerfect staggers on, still cherished particularly by lawyers who love its ability to sort all their ‘whereas and inasmuch as the party of the first part’ convolutions into very pretty sub-sub-sub-paragraphs. Then there’s the excellent though slightly-dated and astonishingly free complete office suite, LibreOffice. Did I mention that it’s free? It’s free. Amazing. As a self-confessed computer nerd I can happily fossick among the esoteric delights of obscure software manuals, or get my smart TV to play files from my tablet which got them from my computer which got them from my router which got them from dark web programs which fell off the back of the internet. Where the hell is my euros symbol? Why must my shopping lists automatically have bullet points? Why do I keep having to scroll all the way past Albanian, Burmese, Corsican and Dzonghka (what?) to specify English for each and every document I create? Thank heavens my native language isn’t Wolof or Yoruba. How do I start page numbering after the title pages? How do I place photos on the page where I want them, not where Word decides they should be? And most exasperatingly of all: exactly where has Word automatically decided to save my precious document this time? I want it back, dammit! YOU don’t have to buy a Dummies book just to put words on a screen, despite how patronisingly-amusing they can sometimes be. There are plenty of free tutorials online not just for Word in its various three-yearly iterations, but for the whole Office shebang, including excellent guides at https://www.gcflearnfree.org/subjects/office/jects/office/ or http://www.free-training-tutorial.com/microsoft-word-online.html. There’s a popular smartphone app called Tutorials for Word – Free, or you can download a free starter guide to use offline: https://www.computer-pdf.com/office/word/472-tutorial-introduc tion-to-word-2016.html. A Google search will reveal these and fleets of other free and paid options. Whatever you do though, don’t ever admit that you need a manual to anyone below 40, for whom the well-known acronym RTFM is a despicable admission of defeat. RTFM? Read The (er, Flaming…) Manual.